Two Player online co-op with the developers to celebrate the three year anniversary of the game. 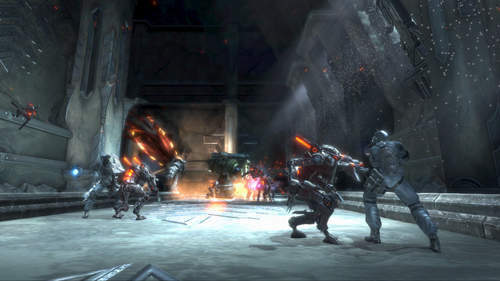 It's hard to believe Too Human, the two player online co-op Action/RPG from developer Silicon Knights is turning three. To celebrate the event, the official fansite for Silicon Knights is putting together a week long celebration of co-op gaming not only with the community, but with the developers as well. On top of that you can enter to win numerous prizes like signed copies of the game or a mini Silicon Knights for your desk. The main event will be between 8pm and 10pm Eastern each night as up to four Silicon Knights employees will be hosting co-op games to play and chat with the community. Stay tuned for the gamertags they will be using and who will be on each tag. Each night you are lucky enough to play with a developer you will get one entry in a prize give-away. The first prize I will announce now is a chance to win one of three copies of Too Human signed by the one and only Denis Dyack. The event runs tomorrow, August 18th through August 24th. You can find full details on SiliconKnights.net. Too Human Demo Coming Next Week!